If you want to prevent termite damage in your Arrowhead home or business, scheduling a professional termite inspection is an important first step. While you may think that your home has been spared, odds are that you are simply unaware of their presence or have not been able to see any termite activity-yet! Varsity understands that you have a lot invested in your home or business structure and therefore you should protect it to the best of your (and our) abilities. Our pest control experts have assisted Arrowhead residents in the detection of termites, for many years. The best defense against bugs starts with knowing they are there- a pest home inspection therefore is crucial. Whether you are purchasing a new home or selling your home in Arrowhead, our experienced Arrowhead home termite inspectors can provide you with the comprehensive termite inspection services you need. Varsity Termite and Pest Control is the top-rated termite inspection and termite control company in Arrowhead and has been providing Arrowhead homebuyers with top-rated termite inspections and termite extermination services since 2010. If you see any of these warning signs, contact the Arrowhead termite inspection professionals at Varsity Termite and Pest Control. Our termite control experts will inspect your new home for termites and provide you with a comprehensive report and extermination plan. Varsity Termite and Pest Control prides itself in providing a 100% satisfaction guarantee and five star customer service. Call today and speak to one of our experienced termite inspectors, receive a free and friendly quote, and schedule a free in-home consultation. Inspecting your home for pests takes time. Since most bugs are rather small, it is important to hire an Arizona pest control professional who is trained in detecting bug activity and who is in the know where they like to hide. Many bugs hide during the day and are night active, or as it is the case with termites-hide inside the wall, where you can’t see them. By using thermal imaging tools and other specialized equipment, Varsity’s home inspector are able to detect bugs long before you do. As with everything, the sooner you are aware of a problem, the easier it is to fix it. Only work with an experienced and licensed home inspector. An inspection should last longer than ten minutes, usually around an hour, depending on the size of the building. After, you will get a detailed report of our findings along with suggestions of how to proceed (should treatment be necessary). Need a licensed termite inspector for your Arrowhead home? Our professional termite home inspectors can provide you with the affordable and efficient 85338 termite inspection services you need. If you are in need of a termite inspection for your Arrowhead 85308 home, trust the Arrowhead termite inspectors with the most five star reviews on Yelp, Google Maps, the BBB, and HomeAdvisor. Termite services can be costly. 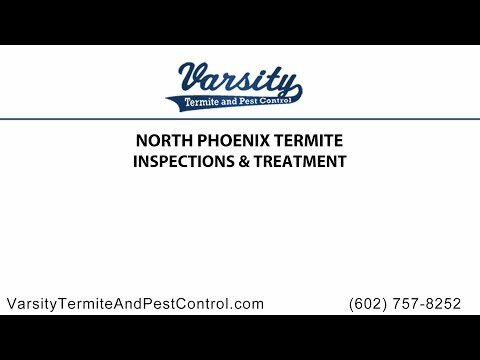 Trust the experienced termite home inspectors at Varsity Termite and Pest Control to provide the affordable 85310 termite inspection services you need in Arrowhead, Arizona. Why Should I Care About Termites? While termites aren’t likely to bite you, they can hurt your home tremendously. They are responsible for billions of damages every year. Why? Because they sneak into your home, you can’t see them and they eat 24/7 feeding on the cellulose of your Arrowhead residence or business. Worst case, they can cause a building to collapse. While working with an experienced termite professional is the best you can do, you can take certain precautions that minimize the odds of a swarm taking possession of your home. Varsity suggests you keep your home dry and clean, fix leaks and remove rotten wood and never stack wood against your walls. Broken sprinklers should be fixed as soon as possible. Varsity Termite and Pest Control is a top rated Arrowhead area pest elimination company. We have years of experience and are licensed as well. Our exterminators have a tremendous amount of field experience in detecting and combating pests of all types. There is no excuse to not get an Arrowhead home inspections as we offer them to you for FREE. Once we determine the extent of your termite problem, we can employ the proper termite removal methods, whether it be the use of one of the top termire colony eliminating systems on the market, Sentricon, or any number of other methdos we use frequently. Looking for termite inspection companies near your home or property in Arrowhead, Arizona? Varsity Termite and Pest Control provides the best termite inspection services in the Arrowhead and in surrounding communities. Need a termite inspector nearby your Arrowhead home? Trust the professional and licensed termite home inspectors at Varsity Termite and Pest Control to provide the top-rated termite inspection services you deserve. Are you searching for local termite inspection services for your new home, home sale, or rental property? Our Arrowhead termite inspection company provides local termite inspection and termite prevention services. Contact the Varsity team today to learn more about our comprehensive pest control and inspection services.